Happy Monday! I hope you all had a wonderful Thanksgiving weekend with your family and friends! We spent our weekend visiting family in South Carolina so I did most of my "Black Friday" shopping online and via my phone. I love being able to shop in my pajamas or in the car while we are on a road trip. My husband and I did do a little bit of in store shopping at the Tanger Outlets in Charleston on Saturday and it was surprisingly not that crowded. I can't do crowds which is why I absolutely love shopping from the comfort of my home, lol. I am almost completely finished with my holiday shopping. Woo hoo! 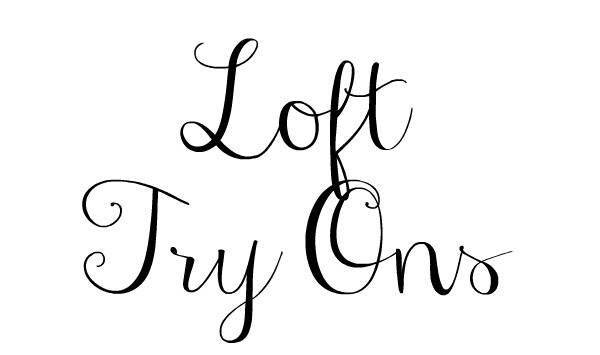 Today, I'm sharing a try on session at one of my very favorite retailers, Loft! In celebration of Cyber Monday, they are offering 50% off of everything plus free shipping! Be sure to use the code CLICK to snag these offers at checkout! 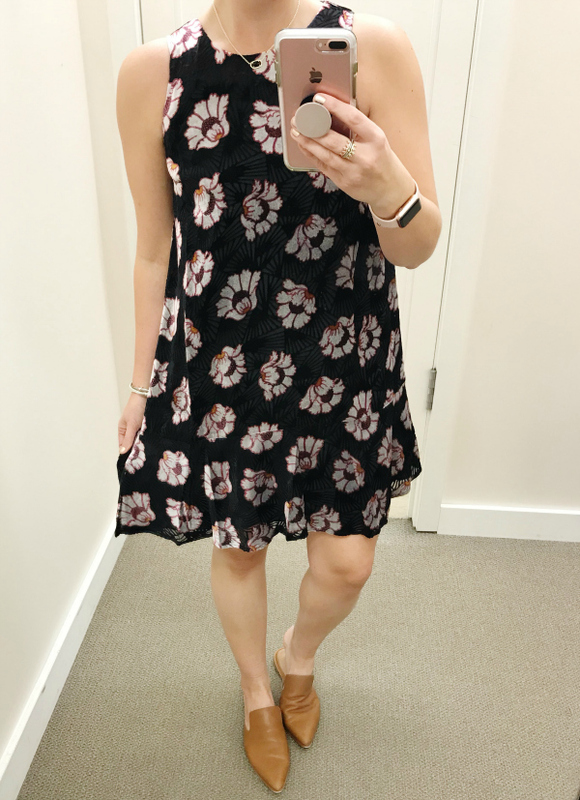 I'm sharing seven items that I tried on below plus sizing and fit details. Loft has so many cute things right now! This top is seriously so soft and cozy! I love the cowl neck detail. This top would be great to wear with leggings or jeans. I will definitely be buying this one! It's such a great basic for your fall and winter wardrobe! Fit: I found this top to run true to size. I'm wearing a size small and I love the fit. The denim leggings are another great basic for your classic. Every woman needs a good pair of stretchy denim in their closet! Fit: The denim leggings definitely run on the smaller side. I typically always wear a size 27 and these were a little snug in the waist in my regular size. If you're in between sizes, I would definitely size up. 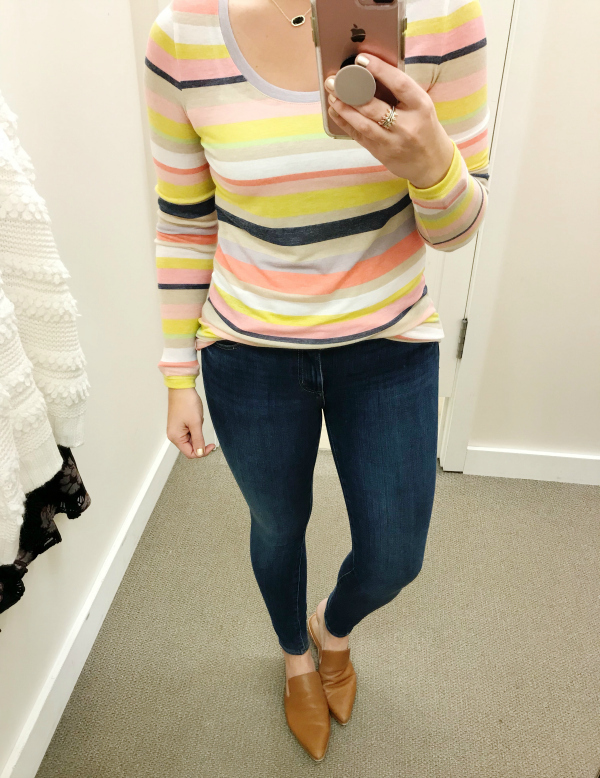 I love the colors in this striped tee and the colors are what caught my eye immediately when I saw this tee in the store. Fit: If you prefer form fitting tees, go with your regular size in this top. If you like a looser fit, size up one size. I tried this top on in my regular size and while it did fit, I prefer my tees to fit loosely so I would get a medium in this one. How cute are the details on this sweater?! It's such a high quality piece that will become your favorite cozy sweater for the cool weather ahead. 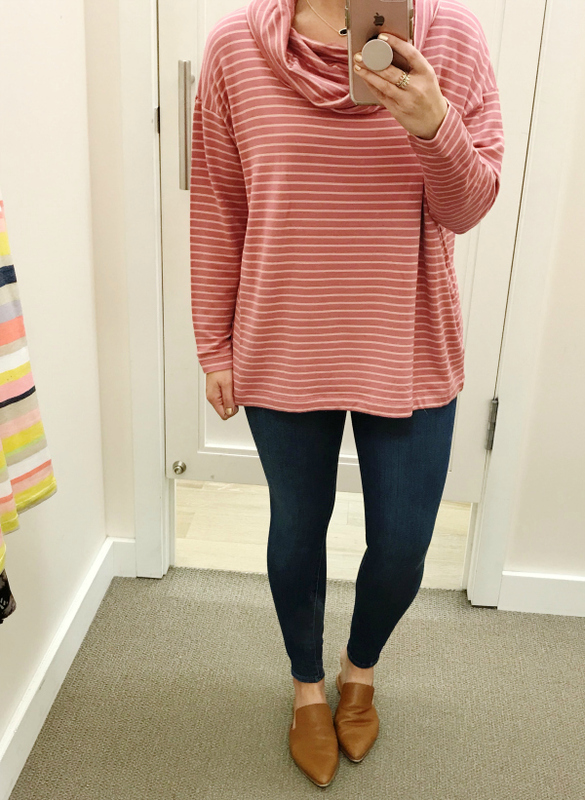 Fit: I tried on a medium in this sweater because I would want it to be a little oversized to wear with leggings. I always prefer oversized sweaters because sweaters and leggings are a perfect combination for me! 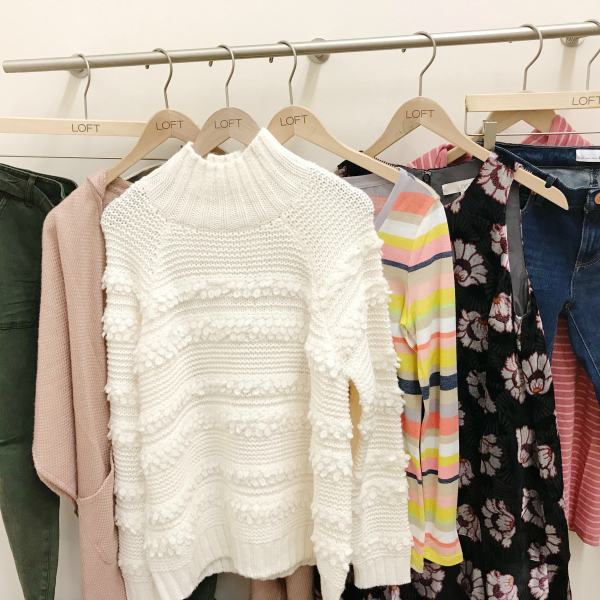 If you prefer a closer fitting sweater, you can definitely go with your regular size. This is such a pretty dress that can dress up for a holiday party with glitter heels, dressed up with a denim jacket, or worn to work with flats and a cardigan. I love the print and the velvet texture! Fit: I found this dress to run a little bit smaller, particularly in the arm openings. I'm wearing a small in this try on but I would definitely size up for a more comfortable fit. 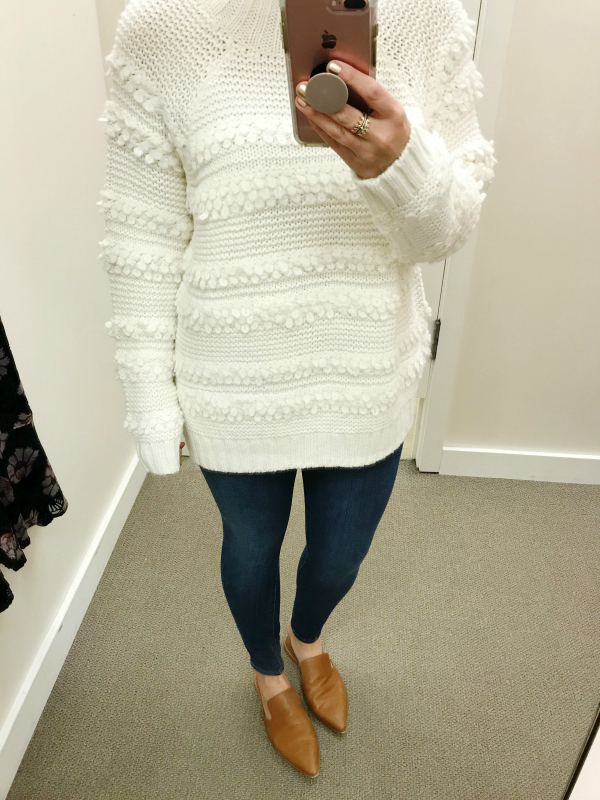 I also really love the details on this sweater, especially the scalloped hemline! 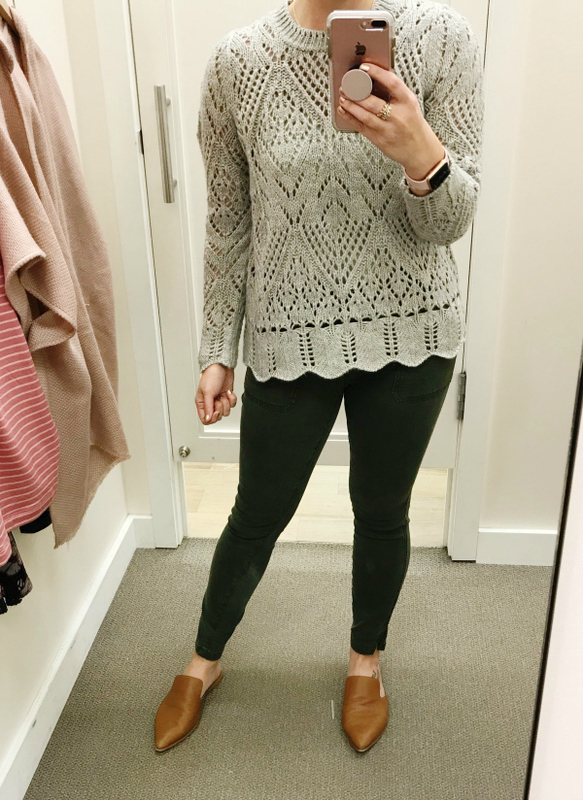 I love this sweater with pants but I think it would also be super cute layered over a basic black dress. Fit: This sweater runs small. I'm trying on a size medium and it fit me like a size small sweater. These pants are amazing! The fabric is so soft, I love the optional tie waist detail, and they have a little zippers on each side of the pants at the bottom. Fit: These pants fit very true to size. I tried on a size four and they fit just right. They also have a perfect mid rise! I love a good poncho! This blush pink one would be super cute with a long sleeved dress or layered with a striped tee. So many options! 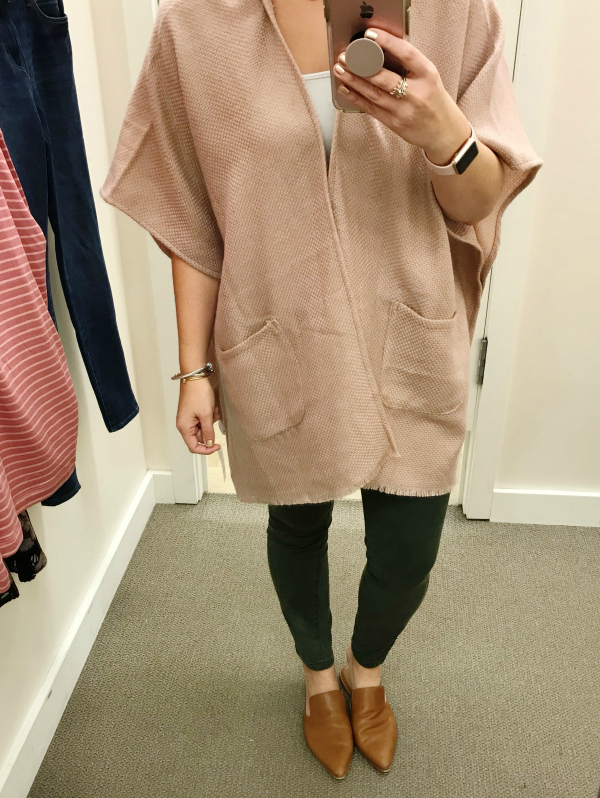 Fit: This poncho is a one size fits all style. Thank you so much for shopping by! Have a great day!